Wayne LaPierre failed to offer a reasonable alternative to gun control—and worse, made his opposition seem downright villainish. I fully expected the National Rifle Association to hold a press conference this morning that would help blunt the momentum for gun control legislation now building in Washington: to solemnly pay tribute to those lost at Sandy Hook; to pledge to work with all sides to stop this from happening again while subtly trying to shift the conversation more towards mental health issues and, heck, maybe video games too. It would make the NRA seem reasonable, and concerned, and give hesitant members of Congress some comfort in sticking to the NRA line. If we truly cherish our kids more than our money or our celebrities, we must give them the greatest level of protection possible and the security that is only available with a properly trained—armed—good guy. Under Asa’s leadership, our team of security experts will make this the best program in the world for protecting our children at school, and we will make that program available to every school in America free of charge. He also refused to take questions from reporters. This truly ludicrous performance came off as a satire of the actual NRA—LaPierre was a cartoonish villain who just doesn’t understand why “gun” is a bad word, and why even more guns in schools isn’t the answer. His proposal is, for starters, completely unworkable politically. Every Democrat will reject this as a response to gun violence. No Republicans would vote for a measure that would cost, at minimum, $5.5 billion annually. The Congress can’t even agree to pass federal aid for Hurricane Sandy—forget about passing the “school shield,” by January or any other time. It’s a ridiculous idea in practice as well. Columbine High School had a sheriff’s deputy assigned to the school who engaged the shooters almost immediately in 1999 and wasn’t able to stop the massacre. At Virginia Tech, there was an entire armed police force on campus that was unable to stop the worst school shooting in US history. As we chronicled last week, there were sixteen mass shootings in the United States this year alone—they occurred at shopping malls, spas, movie theaters and coffee shops. Does LaPierre want armed guards there, and everywhere? What the NRA needed to do was provide a policy idea that pro-gun politicians can hold up and say “how about we try this instead.” They didn’t do that. Right now, the only solution being seriously offered in Washington to reduce gun violence is the plan to ban assault weapons and high-capacity magazines. The NRA also needed to offer a safe home for members of Congress that are on the fence about gun control—and there are a lot of them, after Sandy Hook. The senators like Joe Manchin who have stepped off the NRA party line since last week’s shooting won’t be encouraged to come back after today’s press conference—quite the opposite, in fact. The organization seems more unreasonable and more toxic than it did twenty-four hours ago, and it wasn’t looking so hot then either. This was a remarkable self-inflicted wound by the NRA: but as Atrios noted during the press conference, when you haven’t been challenged by either party for two decades, you tend to have a pretty inflated sense of your own power. 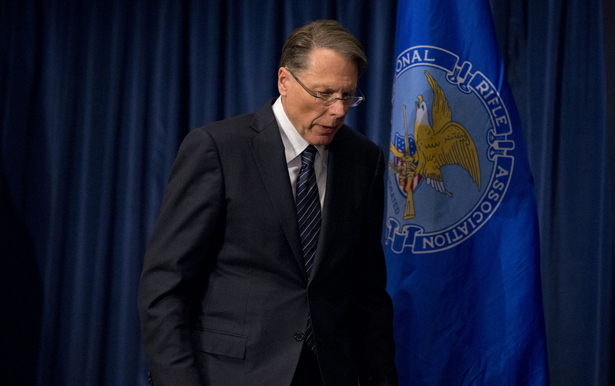 The NRA has much less than it thinks, and that’s good news for gun control advocates. In her latest column, Melissa Harris-Perry warns us to beware of post–Sandy Hook, fear-driven policymaking.